Tomyum is a very delicious hot and sour flavor with citrus notes, and there is an increased popularity for tom yum flavored snacks. We are the first to develop the original Tom Yum hotdog just in time for the 2006 baseball World Series. Try this out--you and your friends will love it. The hotdogs, which are naturally salty, absorb just the right amount of flavor to balance out the high chile heat and lemongrass herb flavor, and we love the hint of fresh galangal which is a bit like mustard. A hotdog everyone will love, either at home with friends, in a local pub or a 5 star hotel. If you like American hotdogs and you like Thai food, this is the best hotdog you'll ever have! Be sure to serve with Maxchup brand Thai Ketchup. Mushrooms are optional but we really like them. In a saucepan or skillet heat 2 cups water then add the fresh lemongrass, fish sauce, galangal, lime leaves, chile peppers and prik pao. Bring to a mild boil and let simmer for a few minutes. Score hotdogs with a knife by cutting several lines just 1/8" deep down the sides, this will allow them to soak up the flavor. Add one or more hotdogs to the heated soup and let cook at low heat as long as you like, 5 minutes or more. Approx 1 minute before removing hotdogs, add sliced fresh mushrooms to the soup and let cook. The mushrooms will soak up the flavor but don't leave them in too long. Spread some fresh Thai basil on a hotdog bun, add cooked hotdog and mushrooms. Pour Thai ketchup on the hotdog and serve with a few pieces of pickled ginger on the side. Serve with strong lager beer, or Thai icetea. Enjoy. You can use the soup over and over again throughout the day to cook your dogs, just add water to compensate for evaporation. 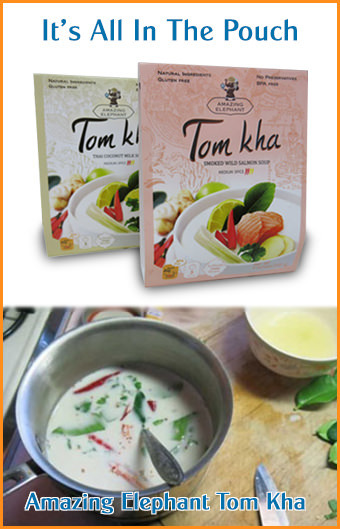 We also have a recipe for original tom yum goong soup.